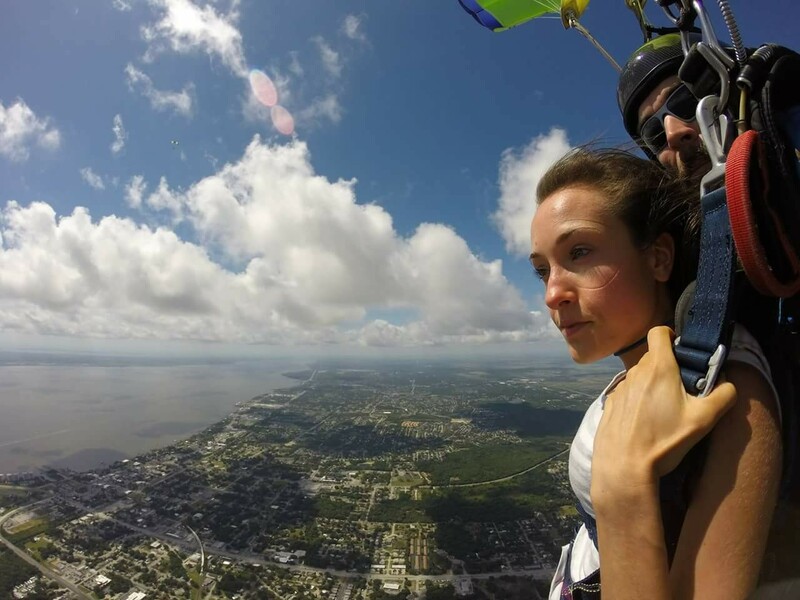 Last spring, I jumped out of a perfectly good airplane and it changed my life. Literally. It was the catalyst that took me from adventurous dreamer to adventurous doer – jolting me out of some serious ‘someday’ apathy. Suddenly, every single item on my bucket list felt not only achievable, but achievable in the NOW. Since that fateful jump in May of 2016, I’ve accomplished the following bucket list items: solo out of state trip, solo international trip (x2), visit the Eiffel Tower (and, you know, Paris), visit Barcelona, solo mountain hike, parasailing, paddleboarding, and flying a plane! Oh, and, I ain’t stopping anytime soon. But, back to skydiving. I’d contemplated it for years, but never thought I’d have the guts to actually go through with it. I mean, really? 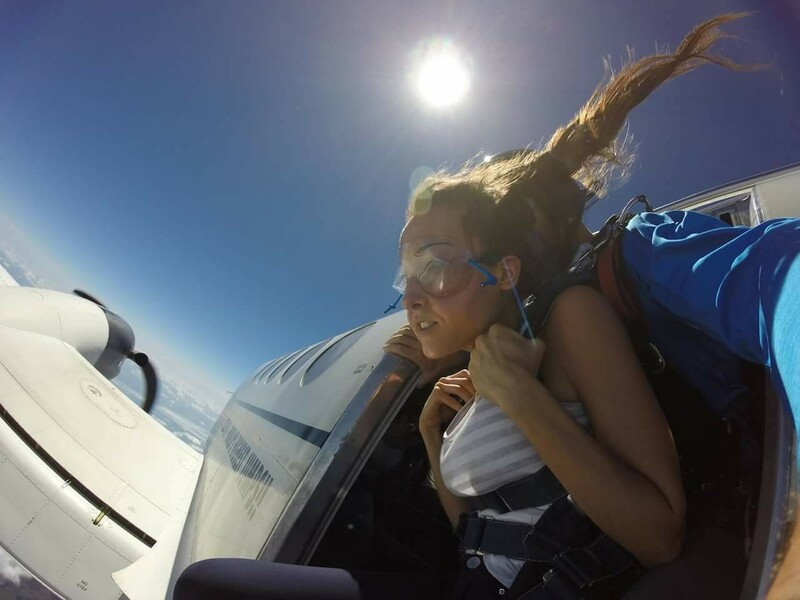 Who does jump out of a perfectly good airplane? An adventurer. That’s who. And that’s ME. I f i n a l l y admitted that it would never happen if I didn’t first schedule a jump. So, late one evening, I spent an hour researching jump spots in Florida, and decided on Skydive Space Center in Titusville. It was a three-hour drive across the state, but I wanted those Space Coast views. After reading (and re-reading) that word ‘nonrefundable’ and keying in my credit card info, I closed my eyes and clicked SUBMIT. Almost instantly, any nerves I had gave way to gleeful anticipation. 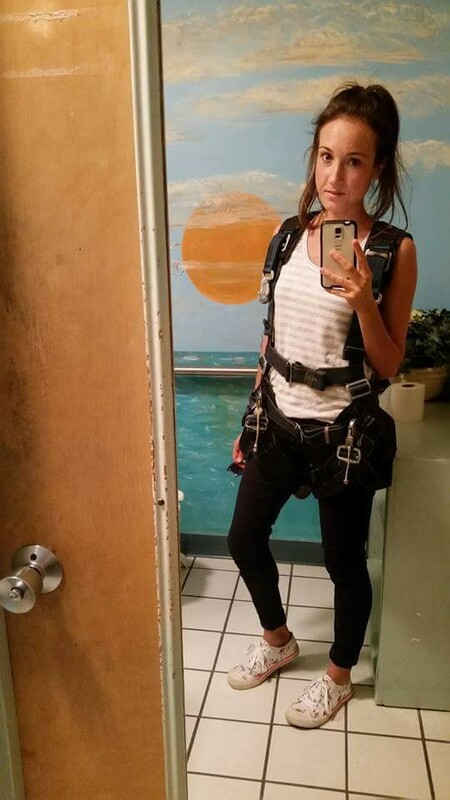 I was going skydiving!! As the day approached, I kept waiting for the nerves to return. They didn’t. Even at the Center, as I signed my life away (for real) and geared up in the plane hangar… no nerves. “Surely they’ll hit me when I’m in the plane,” I reasoned. Nope. If anything, that gleeful anticipation intensified. Then came the moment. THE moment. I stood in the opening of the plane – gazing out at the earth, 15,000 feet below – and it hit me. No, not nerves. The reality of what I was about to do. I was living my dream. It felt like both a millisecond and a lifetime. And then I was airborne. 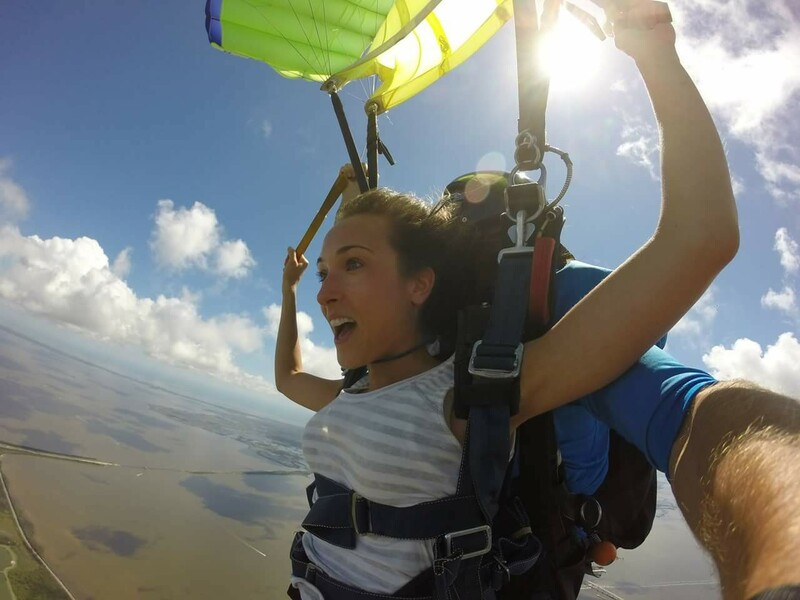 I flung my arms out – completely forgetting to wait for my tandem instructor to tap my shoulder – and folks, I was flying! That 60 seconds of freefall was the most tangible form of freedom I have ever experienced. I wanted to live in the sky; it felt like home! And the views did not disappoint, especially once the shoot opened and our peaceful descent allowed for time to soak in the sun-kissed panorama. When you freefall, you won’t experience that roller coaster drop in your stomach. Your stomach will be perfectly calm, and you’ll feel like you’re floating. 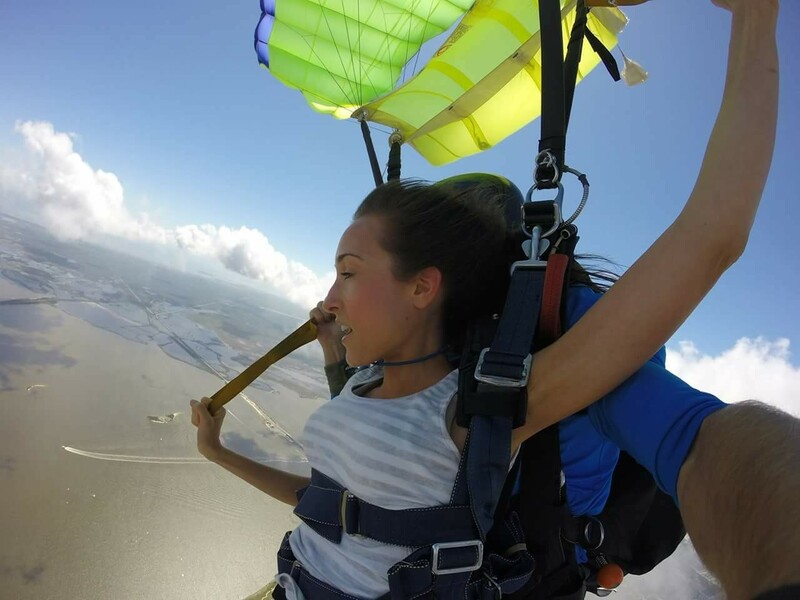 The higher you jump, the shorter your plane ride will be – less time to psych yourself out! Pay extra for the photos and video. I would have forever regretted not having this photographic evidence of my first jump! 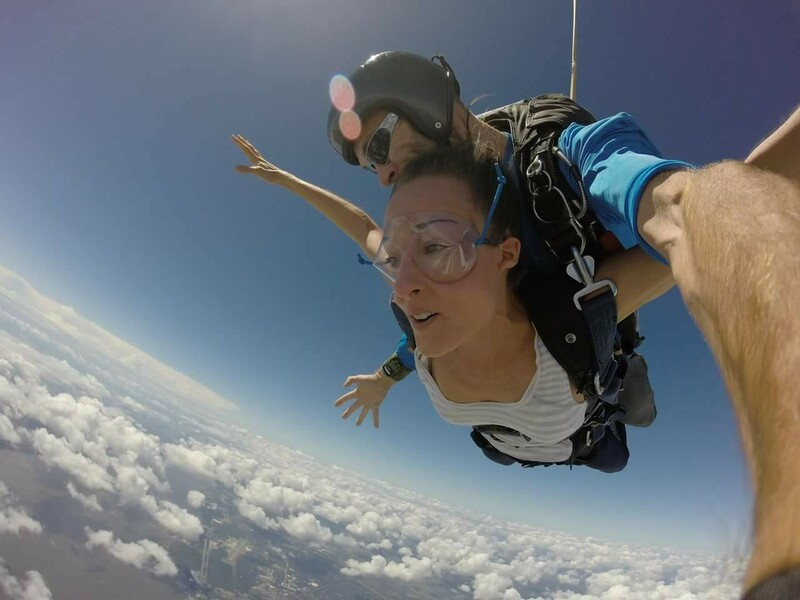 If skydiving is on your bucket list, stop dreaming and take that leap! One more day, s’il vous plait! haha nice! my internal debate on sky diving..looks so fun yet I still can’t get myself to sign up! Oh, I hope you do!! I had that same debate, and I’m sooooo happy I finally just went for it! Let me know if you sign up!